This Thursday, we fly out to join in the fun at Soundwave Croatia 2016, which takes place at The Garden, Tisno, from August 4-8. We’ve lost count of the number of times we’ve played at the festival (we think it’s either our sixth or seventh appearance), but every year it’s the undoubted highlight of our summer. Great music, great people, great weather, great location… what more do you need? You’ll find the tracklist for the mix below the embedded Soundcloud player. The mix is also available on Mixcloud for all the streaming freaks. Summer has finally arrived in Bristol (about time etc. ), and ahead of a new period of Bedmo Disco DJ gigs, we’re returning to the (virtual) wireless. This Tuesday (19th July, 2016) we’ll be making our debut on Soultrain Radio, with the first in a series of monthly shows. The team behind the station have been keen to get us involved for a while, to supplement existing shows from fellow West Country disco/boogie crews Feel The Real and Boogie Cafe (the latter helmed by our old pal and occasional label artist Jimmy The Twin). Tomorrow’s show will feature Awon and Sell By Dave (sadly, Five-Stylez is otherwise engaged playing hip-hop for another radio station), will be broadcast live from the Soultrain studios here in Bristol, and will feature us dropping some killer wax from across the discoid universe. We’ll also be looking ahead to Soundwave Croatia, which kicks off on 4 August at The Garden, Tisno, and features us lot playing records, as well as loads of other top notch bands, selectors etc. So do tune in, as we’ll be playing lots of rather good music, and no doubt Sell By will be his usual idiotic self on the mic (“disco’s own Alan Partridge”, as a regular listener to Bedmo Disco Radio once famously described him). That’s got to be worth two hours of your time, right? Tune in to Bedmo Disco Radio from 10pm-12midnight BST on Tuesday 19th July 2016 on Soultrain Radio. It’s been another memorable year for the Bedmo Disco family, punctuated by memorable parties, cracking events, hugely enjoyable guest spots and a particularly brilliant boat party at Soundwave Croatia. 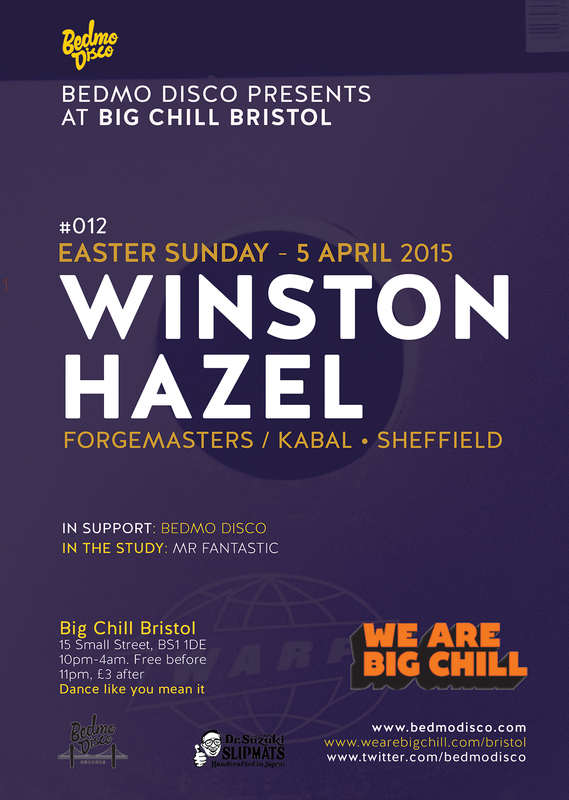 We also waved goodbye to our regular home of nearly six years, Big Chill Bristol, with a series of parties with guests including Winston Hazel and the brilliant Inkswel. Naturally, there’s one last Bedmo Disco party of the year: New Year’s Eve. This year, we’ll be celebrating by taking over the decks at one of Bristol’s best boozers, The Christmas Steps. It’s an intimate space, meaning that it should be a cracking party – a bit like an ace house party, but with a better selection of drinks and us lot on the turntables. What’s more, the venue – run by the team from CRACK magazine – has decided not to charge on the door. That means you can get in free… though the limited capacity means that you’ll need to get down early (we start at nine) to guarantee entry. To get you in the mood, we’ve uploaded a new BedmoCast episode to our Soundcloud account. It’s a live recording of Sell By Dave in the mix at Blue Mountain, here in Bristol, a few weeks back. Enjoy! This Friday, we’re making a guest appearance at what looks to be a killer event at the Cube Microplex. The 54 Director’s Cut Party features a screening of the brand new director’s cut of infamous Steve Rubell/Studio 54 flick 54, polyester-enhanced pansexual performances from a number of local performance artists, a ’70s style buffet and a party until the wee small hours, with People Like Us and ourselves providing the soundtrack. 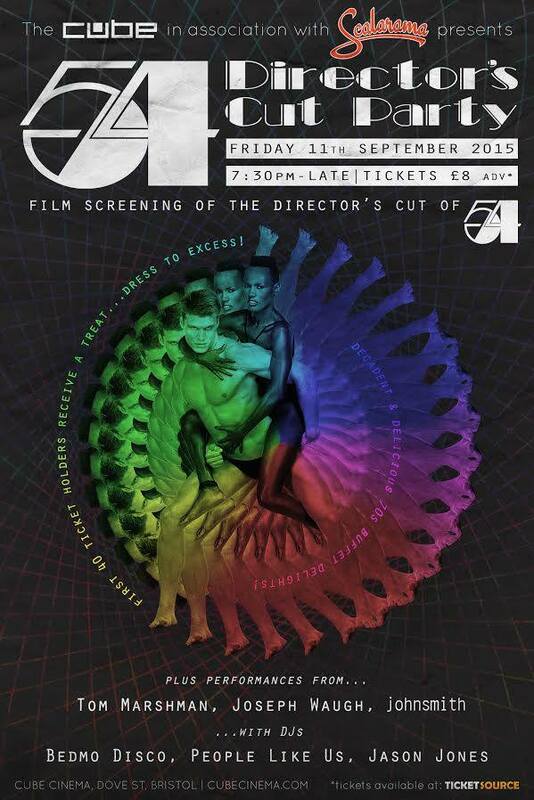 The organisers are keen to “bring some 70s style disco decadence to The Cube”, and we’re happy to oblige. We’ve been to parties there before in the intimate bar space, and it can get pretty rowdy. We’re sure Friday will be no different! Since a new volume in the BedmoCast mix series is long overdue, Sell By Dave decided to jump on the decks and record a “warm up mix” of disco treats to get everyone in the mood for Friday night. You can check it out below. A year ago today, on Easter Sunday 2014, we kicked off the “Bedmo Disco Presents” series – a programme of events featuring hand-picked guest DJs from the UK, Europe, the US, Australia and, of course, Bristol. Our first guest was Lumberjacks in Hell boss Marcel Vogel, who got the party going in his inimitable way. That day set out the formula for what would come over the next 12 months: extra sound, extended sets from our headline guests, and the now familiar pre-gig meal in the local lebanese restaurant. Since then, we’ve had some top DJs swing by to play, including Inkswel, Auntie Flo, Alexander Nut, Justin Van Der Volgen, and Bonar Bradberry. Tonight, we toast that first year – and look ahead – in the company of a man who has flown under the radar a little for most in Bristol: Sheffield legend Winston Hazel. WInston is most famous, of course, for being part of Forgemasters, whose seminal “Track With No Name” – a bleep classic built around loops from Manu Dibango’s “Abele Dance” – was the first record to be released on Warp way back in 1989. By the time that record came out, Winston was already one of the North of England’s most celebrated DJs, having built his reputation via various weekly and monthly residencies in the Steel City, most notably at the now legendary Jive Turkey parties (alongside his old pal Parrot, who retired from DJing many years ago). In recent years, Winston has been entertaining Sheffielders via the Kabal parties he runs alongside a collective that includes old pals Raif Collis, Pipes and, if he’s in town, Todda T (it was the Kabal crew who gave Tom Bell the ‘Toddla’ tag, due his tender years when he started playing for them). If you’re still unsure as to Winston’s credentials, or want to know more, there’s an extensive interview (with accompanying mix) on the Test Pressing site. The words were penned by our own Sell By Dave. As usual, we’ll be starting at 10pm, there will be extra sound, and it’s free to get in before 11pm, £3 after. Spread the word – Winston will do a terrific job, and this is a rare chance to see a true master at work in Bristol. 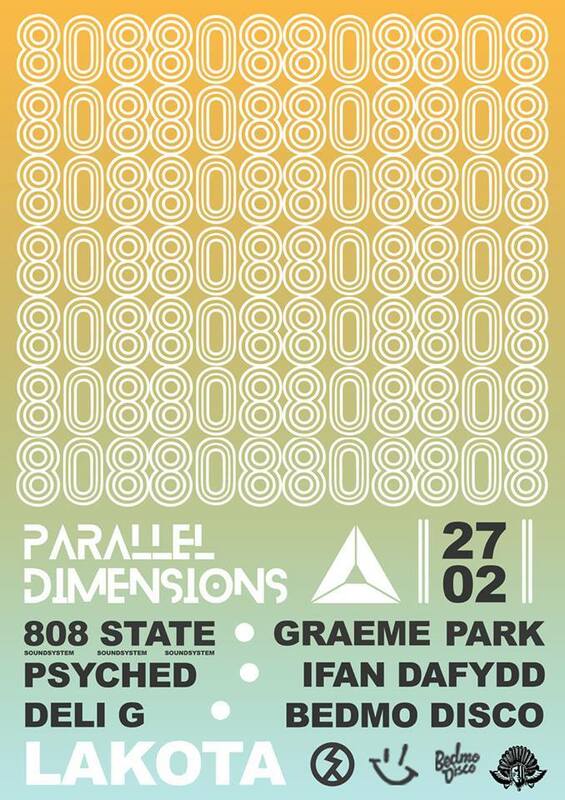 Those who follow us on social media will know that we’re quite excited about the next party we’re playing at, Parallel Dimensions Presents Skyline at Lakota, this coming Friday (27th February). Laila, the woman behind the fast-rising Parallel Dimensions parties, asked us a while back if we wanted to host a room, and we jumped at the chance. We’ve had some great times in Lakota over the years – it’s a legendary Bristol venue, after all – and that third room, the smallest of the lot, is a brilliant little “rave cave”. It’s perfect for an intimate gathering and you can really get the party going. There was another reason we said yes to her request, though: the main room line-up. It features two legendary figures from the days when Manchester’s Hacienda was arguably the centre of the clubbing universe: 808 State and Graeme Park. Neither should need bigging up; the former were one of the pioneering production/live outfits in the British dance music revolution of the late ‘80s and early ‘90s, and were responsible for some stone cold classics during the rave era (“In Yer Face”, “Pacific”, “Cubik” etc). As for the latter, as resident at the “Hac” (alongside Mike Pickering), Park was responsible for putting the venue on the map, providing the soundtrack to the first E generation’s clubbing coming of age. They’ll be joined in the main room by our old pal Deli G, who’s as legendary in our city as 808 State and Graeme are in Manchester. As for our room, we’ll be joined by another local legend – Tristan B, who has been DJing in clubs and on the radio in Bristol since the mid 1980s – and a long time friend of the family, Legendary Tone. He’ll be playing back-to-back with Sell By Dave (as they often do at best before:) to round of the evening. In association with Parallel Dimensions, we’ll also be making a big effort on the décor, making our room look suitably disco (think The Loft parties in NYC). We can’t recommend the party highly enough. We hear ticket sales are pretty brisk – if you want to come along (and we’d love you to join in the fun) you can grab tickets from Bristol Ticket shop or Resident Advisor. As part of the build-up to the party, we offered to do a mix to get everyone in the mood. Sell By Dave laid it down in one-take (as usual) on the spur of the moment. You can stream/download it below. It features a riotous mix of disco, electrofunk, house, proto-house and early US garage dubs, plus the odd rave classic, unreleased Bedmo Disco family cuts/edits/tracks, and some obligatory 808 State towards the end. 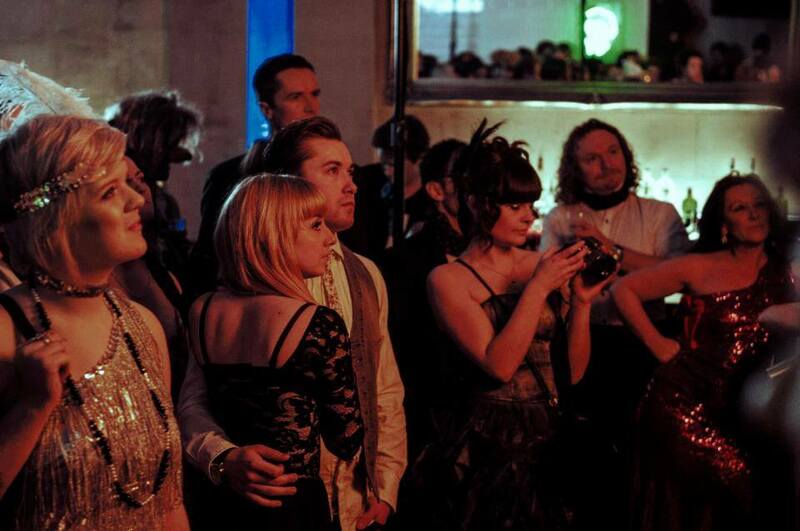 Hopefully it should get you all in the mood for the party… it’s going to be ace! By now, you should be used to us blathering on about how excited we are about the latest guest DJ to swing by Bedmo Disco Presents at Big Chill Bristol. Even so, we’re more excited than normal about the visit of INKSWEL tomorrow night (Saturday 7th February). 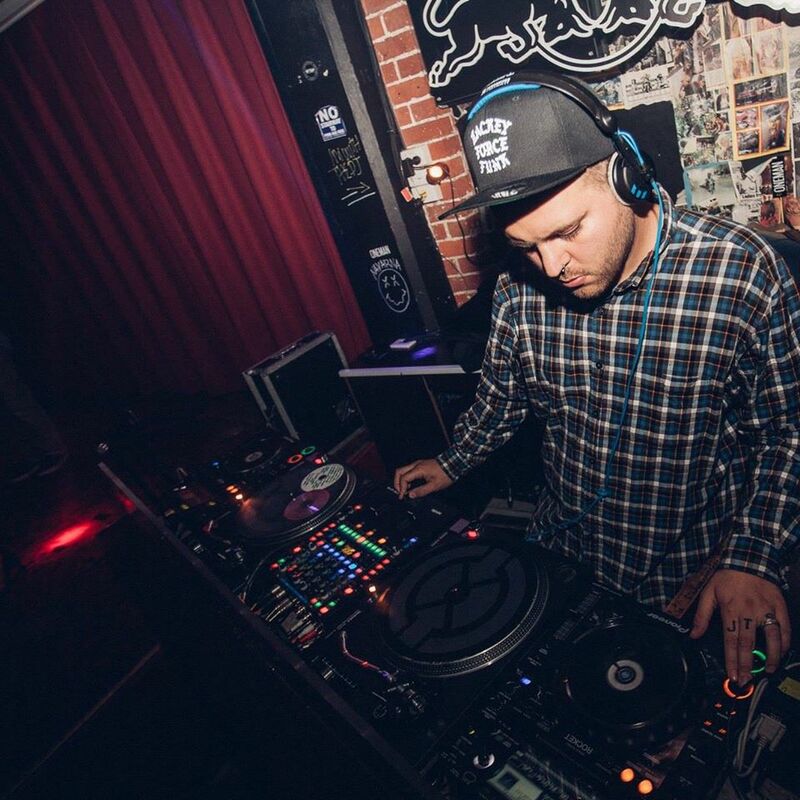 We’ve been fans of the Australian producer since hearing his 2011 Glass Tear Groove EP on Boogie Bash. Since then, he’s gone on to deliver killer material in his distinctive smooth, soulful, drum machine-heavy style for Unthank, Faces, Dopeness Galore, Wolf Music, People Like Jam, Burek and Hot Shot Sounds, the label he co-founded with another Bedmo Disco fave, Freekwency. He recently signed a deal with BBE, and the much-loved label will be releasing some retrospectives of classic material ahead of a brand new album later in the year. All of those will be worth listening to. His style is distinctive: hugely influenced by classic boogie, ‘80s electro and electrofunk, of course, but also modern soul, hip-hop and deep house. He recently recorded a guest mix for our BedmoCast series – unveiled on our Invader.fm show earlier in the week – and it was one of the best we’ve been given to date. We’ve stuck it below so you can listen – seriously, it’s excellent. Being Melbourne-based, Inkswel rarely gets across to Europe. It’s a bit of a coup to get him, so we’re naturally delighted that he’ll be making his Bristol debut on Saturday night. In fact, he’s only doing two UK dates (the other being in London for our pals from Soft Rocks), so it really is a rare chance to see a young master at work. In addition, we’re delighted to be welcoming DJ Ryu and the Rockit Science crew to the Big Chill. They’ll be hosting the study, and have secured a pretty hot guest in Bristol-based deep house producer James Fox (Futureboogie Recordings, Well Rounded Housing Project, Quintessentials, Needwant etc). Oh, and if that wasn’t enough, we’ll also be adding extra sound to make Inkswel’s set sound extra-heavy. All of this is free if you get down before midnight, and £3 after. It’s a party not to be missed, that’s for sure. 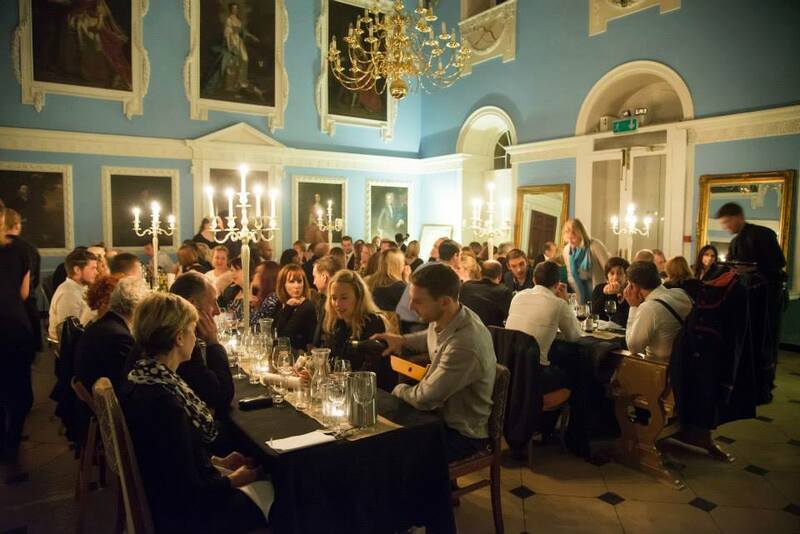 How does dancing the night away in a luscious stately home on the outskirts of Bristol sound to you? Pretty good, eh? Well, you’ve got a chance to do just that this Friday night (February 14th) at the first Maison Paradiso event at Kings Weston House. Oh, and we’ve got ten tickets to give away! It promises to be a magical evening. 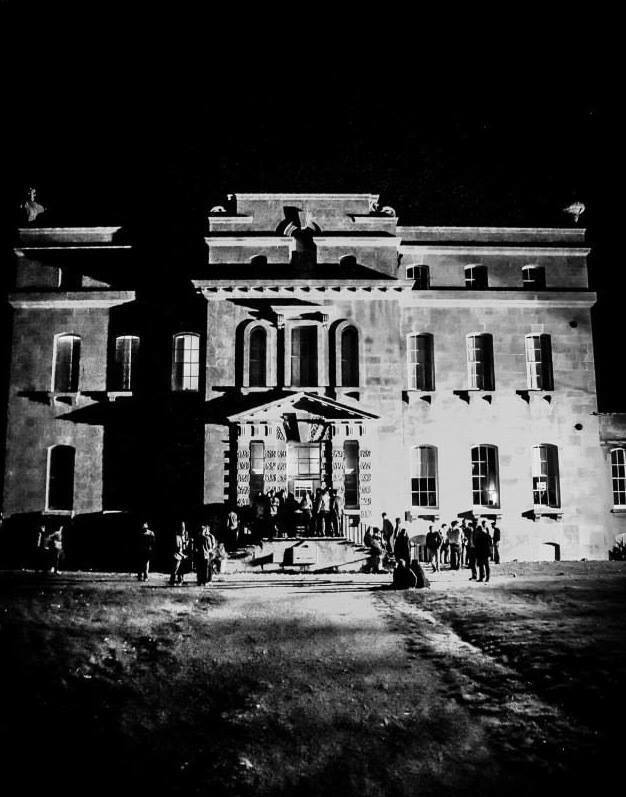 Maison Paradiso is a new event from Bristol promoter Keda Breezze, who specialises in putting on imaginative, one-off events that mix music, theatre and cinema in stunning locations. Friday’s event is in two parts; the first is a cocktail reception and three-course meal from pop-up restaurant specialists Mi Casa. That will be followed by a big old party, with Bedmo Disco DJs (Awon, Five-Stylez and Sell By Dave) providing the soundtrack until the early hours. There’s a cocktail bar (staffed by Bristol’s best cocktail barmen and waitresses, no less) and a silent cinema room, if the sweaty disco and boogie party action gets a bit much. Guests are asked to “dress to impress”, giving you a chance to put on your glad rags. Seriously, we’re really excited about this. It’s not often you get to dance like mad and sip cocktails in a stately home. And Kings Weston is some stately home; Grade 1 listed, it was recently restored to its 18th century glory (it was designed by Sir John Vanbrugh, who also designed Blenheim Palace). It’s located near the Clifton Downs and is just eight minutes by taxi from the city centre. Sadly, tickets for the dinner and dance are now sold out, but a few tickets are still available for the party, priced at £10. You can get them here. Now for the exciting bit: we’ve got 10 TICKETS for the party to give away. To be in with a chance of grabbing a ticket (or more), just email us with your name and contact telephone number, stating how many tickets you’re after (perhaps a pair, so you can bring a mate or your partner). We’ll draw the winners at random on Thursday morning (Feb 13th), meaning you’ve got until midnight on Wednesday to get your entries in. Good luck, and hopefully we’ll be seeing you on the dancefloor. Remember: make an effort, it’s going to be a special night! 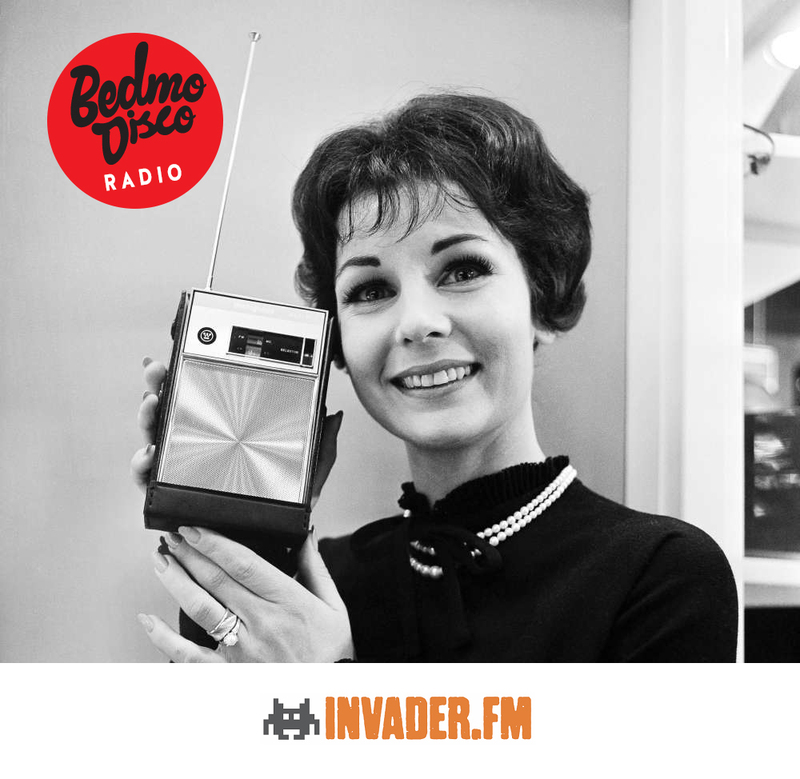 Bedmo Disco Radio returns to the virtual airwaves tonight, Tuesday 4th February, on Invader.fm. We’ll be broadcasting live across the web from 8pm GMT. As usual, we’ve got another action-packed show lined up. As well as the usual blend of good time grooves, dusty obscurities and all-time classics, there’s an interview and guest mix with our good friend Uncle Vibes, whose shows on K2K Radio and SoulradioUK are fast becoming essential listening at Bedmo Disco HQ. As usual, Sell By Dave will be showcasing a bumper selection of new and forthcoming releases from across the musical spectrum, while we’ll also be looking in more detail at the Soundwave 2014 line-up. As if that lot wasn’t enough to tickle your fancy, we’ll also be exclusively revealing the next single release on Bedmo Disco Records – our first since the tail end of 2012. We don’t think you’ll be disappointed. So, tune in from 8pm, and if you’re locked get in touch for shout outs, requests and on-air banter. You can tweet us, leave a message on our Facebook page, or email us.